NEW YORK – Gone are mystique and aura, the two temptresses of the Bronx, who blessed old Yankee Stadium with kismet and joy and brilliant baseball. In their stead are apathy and malaise, a couple of hags from Yonkers. They embody the new Yankee Stadium, a sarcophagus if ever there was one: no matter how gorgeous and ornate the outside, it remains filled with lifelessness. No wonder Game 2 of the ALCS featured thousands of empty seats, like Game 1 before it, and like the do-or-die Game 5 of the ALDS, too. New Yorkers understand a fraud when they see it. They pay for expensive seats, drink overpriced beers, buy exorbitant merchandise and fund a $200 million joke, a team that for the second straight game couldn't score a measly run off the Detroit Tigers' Nos. 3 and 4 starting pitchers. These Yankees earned every last boo. The vitriol that has evolved here over the last week apexed Sunday with a 3-0 loss in which Robinson Cano extended his record playoff hitless streak to 26 at-bats, Curtis Granderson struck out three more times in three at-bats and Alex Rodriguez whiffed twice. Something is different here. Very different. Not only are the Yankees searching for their identity with a series deficit of 2-0 and three games beckoning in Detroit, their ravenously loyal fan base is revolting against an old, overmatched, passionless team. "Our fans haven't had much to cheer about, so you can't blame them," Rodriguez said. "You've got to blame us. If I was sitting there, I'd be perplexed, too. We didn't score any runs. What the hell are you going to cheer about?" A Rodriguez hit. Seriously. That's what drew the evening's loudest ovation. A single up the middle, just his third hit in 23 postseason at-bats. That's the new standard. That's what the most feared and hallowed place in baseball has come to. Yankee Stadium: Where they roar for a single. Don't think this went unnoticed, either. It wasn't just the ushers instructed to fill in empty seats so the crowd looked better on TV. The players can tell, too. "This is a very easy place to play now," Tigers outfielder Quintin Berry said. "Coming from Oakland, the fans there were so rowdy. It was easier to come here." Oakland Coliseum, where tarps cover the upper deck, more electric than Yankee Stadium. Every other playoff stadium filled to capacity, and Yankee Stadium with entire sections empty, thousands of unsold tickets, even ones as cheap as $15 through resellers. No matter how the Yankees spin this – team president Randy Levine had the hubris to blame StubHub – the swiss-cheese crowd is a stunning indictment on their failures to transition the atmosphere of the old stadium to the new one. The cratering secondary ticket market bears out the criticism that face-value ticket prices are excessively high – that the Yankees priced out the average fan in search of corporate blood money. This is their comeuppance: a bloated team, another playoff flameout at hand with Justin Verlander primed to carve them up Tuesday in Game 3 and a fan base so disenchanted it spent far more time booing its own than its opposition. Here's how far it has degenerated: Nick Swisher said some fans blamed him for Derek Jeter's broken ankle, suffered toward the end of Game 1 following a misplay in which Swisher lost a Delmon Young fly ball in the lights. "That's the last thing I ever thought would be in this ballpark: that people would get on you that bad," Swisher said. "Especially your home, man, where your heart is, where you're battling and grinding all year long. It's just frustrating, man. You never want to be in that spot. It's not like you're trying to go out there and do bad on purpose. To which the hags say: Boo freaking hoo. Swisher is 4 for 26 this postseason, contributing to a Yankees offense hitting .202. New York has scored seven earned runs in 43 2/3 innings thrown by opposing starters. The ugliness has metastasized throughout the lineup. Its sudden appearance in October is the starkest reminder that no matter how many division championships the Yankees win and playoff berths they earn, fans judge them on how they finish. And while the Yankees' one championship since 2000 is one more than 20 teams can boast, it cost nearly $2 billion, money siphoned from fans who expect a far greater return on investment. If they're going to pay silly subscriber fees for YES and take a plundering with each trip to the Bronx, they expect better than $114 million of that money owed to a 37-year-old who is 0-for-19 with 13 strikeouts against right-handed pitching this postseason. "Nothing against our environment here, but a change of scenery sometimes helps a little bit," Rodriguez said. "Maybe some of our guys will relax a little bit and go out and have some fun." No, it's not easy playing when a support system turns so vociferously. Yeah, well, it's not easy being asked to support a team that performs so badly at the most important time of the year, either. The Yankees are staring into a deep abyss. Their core keeps getting older. Their pitching woes remain palpable. Their farm system – especially the upper-level arms that were supposed to be here by now – has dried up considerably. It's not like Jeter's injury was some sort of sign. It was just a reminder of what was – and what is no longer. Jeter represents the era in which the Yankees could do no wrong. They won so much only a contrarian could view the franchise with cynicism. Those Yankees earned every ounce of pride. It's easy to wonder how much of this traces back to the passing of George Steinbrenner, their bombastic owner. While he presided over more than a decade of misery that preceded the late '90s dynasty, his presence throughout the winning cannot be overstated. The culture under Steinbrenner was about the team. The culture today is about the business. 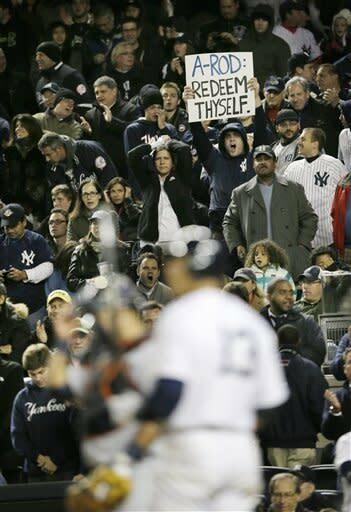 Yankees fans loved Steinbrenner. Yankees fans don't know his sons. The urgency then was palpable. The urgency now is questionable. Oh, manager Joe Girardi tried as he may, first with a pregame speech to rouse the team from its Jeter-related depression and then by getting ejected from Game 2 when reminding umpire Jeff Nelson just how badly he mangled an important call at second base. Neither stirred the somnambulant Yankees. They shrugged their shoulders. "There's no explanation," Cano said. Maybe not for the sudden inability to hit. There's a plenty good one for everything that permeated the stadium Sunday. Apathy and malaise didn't just show up this week. They've festered for a while, building, growing, readying for the proper moment to explode. And here they came, those old hags, happy to let this embarrassing Yankees team understand. They earned this. Every last bit of it.